ROCHESTER, Minn. – Endometrial cancer triggers remain elusive, despite continued research. But given the typical inflammatory profile in these cases, microbes in the uterine environment are suspected to play a role in the development of this disease. 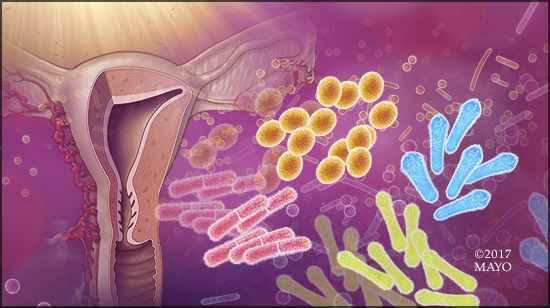 To probe the microbes directly within the uterine environment and examine how these microbes could influence cancer within the endometrial lining, Mayo researchers conducted the first direct assessment uterine microbiome study published in Genome Medicine. The research team studied 31 Caucasian women undergoing hysterectomy. Of those, 10 women were diagnosed with a benign gynecologic condition, four women were diagnosed with endometrial hyperplasia, and 17 women were diagnosed with endometrial cancer. All diagnoses were made based on the final surgical pathology following hysterectomy. The authors report that the populations of microbes found throughout the reproductive tract are shifted in the presence of cancer and hyperplasia, and were distinct from the benign cases. Based on the results of the study, the researchers are seeking an ethnically diverse patient population to investigate whether the results extend to other populations. And further investigation is needed into the role of the microbiome in the manifestation, cause, or progression of endometrial cancer. According to Dr. Walther-Antonio, because of the modifiable nature of the microbiome, this discovery also holds the promise of a critical advance in endometrial cancer prevention. “These findings provide important insights into the etiology or manifestation of the disease with broad implications for biomarker development in the early detection of, and screening for, endometrial cancer,” says Dr. Walther-Antonio. This work was supported by the Mayo Clinic Center for Individualized Medicine Microbiome Program; the Microbial Community Metabolism and Health Program Career Development Award Education/Disease; the John W. Anderson Foundation; and the Division of Obstetrics and Gynecology, University of Cagliari, Italy. The authors did not declare any competing interests in this publication. Mayo Clinic Minute: What should be in your sports drink?